Someone I love and honor posted a meme. It is not significant what the meme said. What is significant is the fact that the meme was completely false and generated by someone knowingly creating it with the intent of promulgating misinformation on social media. This meme has been picked up and published and re-published across the internet adding to the culture of those who say, "you have your sources and I have mine" The internet has been a force for good in many instances, but fearfully it has also allowed the promulgation of malicious misinformation. But what if reason is not left free to combat error? What then? 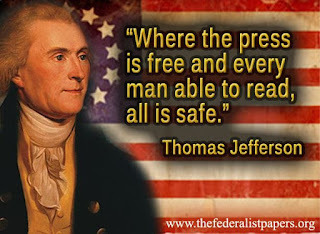 Jefferson never expected a world in which a lie could simply be repeated enough to win the day. How did we arrive at this point? I remember studying history and being fascinated by the role of propaganda in the rise of Nazism across Europe. I remember thinking in a sort of naive "American Exceptionalism" way -- That would never happen here because the press would expose such a lie early and often. Now a year into Trump's presidency I am disabused of such a notion. The president simply says whatever is expedient at the moment and changes his statements depending on current perceptions of his base. Our press has done a good job of exposing these lies, but the president has marginalized that with has his own network (Fox) and his constant tweets obfuscating and producing a confusing string of words. We are called on to simply believe the most recent tweet. We are not to look into the past tweets to compare. Early in the campaign, I noticed these memes and tried to track them down to confirm their veracity. I couldn't find their source. It was so hidden that one could not find the original writer. Some of these were particularly egregious, like the one about the Pizzeria in D.C. where Hillary was supporting child trafficking. Another report which had an "FBI agent suspected in Hillary email links found dead" This one turned out to trace to the Denver Guardian. In checking on the Denver Guardian I discovered that it wasn't a real site at all. The Denver Guardian was nothing more than a web site with links that did not work, with no way to learn who was responsible for it. It even had a fake street address. So the information was created for the sole purpose of misleading and getting people to click on other fake news stories. How do we fight this kind of thing in a world where my dear friend says he doesn't want to hear anything that might contradict what he believes? Perhaps you are saying that I do the same. I assure you that is not true. For example when I see a meme or post that I really want to be true, my go to thought today is to check it out before I repost it or forward. I acknowledge my bias to be sure, but I want to know the truth beyond that bias!